October 23 will be the first public opportunity to see preliminary design plans for Section 2 of the High Line (20th Street to 30th Street). The High Line design team lead, James Corner, principal of landscape architecture firm Field Operations, and Ricardo Scofidio, of architecture firm Diller Scofidio + Renfro, will present the design concept, answer questions, and take comments. The sleek, computer-driven architectural previews of New York’s first midair park, the High Line, depict pedestrians navigating a public promenade that is on track to be celebrated next fall. Like space-age schematics, they offer a futuristic refuge: a pristine ribbon of green providing exquisite views of Manhattan. But the High Line has been something quite different, a flaking, rusting industrial ruin that needed to be transformed to match the digital renderings. And someone has been doing all that work. So right now the High Line is one hairy construction site. Fifty hard hats in safety orange — including ironworkers, carpenters, painters and garden-variety laborers — perform a fast-tracked logistical ballet 30 feet up on the line, as steel and concrete are delivered just in time to be grappled into place. Bridges freeze before roadways, of course, and thus it is on the High Line, which shimmers with icicles at times while vibrating with hard winds from the Hudson. Safety railings sing in the gales, and it is not uncommon for snow and sleet to blow upward, swirling in updrafts shaped by the patchwork of low-rise buildings underneath. Not unlike the hardy wildflowers, shrubs and even apple trees that adapted to the lost world of the track bed, workers have already embraced the onset of winter. “The cold is great — bring it on,” said John Forbes, 43, an ironworker. “We really don’t mind cold. It’s heat that’s the killer.” He referred to the summer’s labor on the unshaded railway radiating hotly from its 8-inch-thick concrete slab. Of course, high wind — as on a recent afternoon punctuated with chilly gusts of 40 miles an hour — forces managers to shut down the construction cranes. A freeze curtails the concrete pours and painting forays, while ice and snow divert topside workers to their shovels before they can scurry to tasks on the line’s dry undersurface. The project that has been promoted as the new Central Park for downtown is, currently, a mile-long obstacle course. The rail bed threads its way not only through High Line construction but also 10 other developments, including a new tunnel through the Standard Hotel at Washington and Little West 12th Streets. Save for a parcel near Gansevoort Street, the city owns none of the real estate underneath the High Line aside from streets and sidewalks. “You do not want to drop things from on high,” said Gerard Zimmermann, 40, a chief inspector for Kiska. The roadbed’s elevation is nothing, of course, to workers accustomed to dancing on high steel. “For me this is pretty easy,” said Mr. Zimmermann, who has walked atop the George Washington and Verrazano-Narrows Bridges. Nevertheless, the airborne landscape poses safety issues and other, more personal constraints. For example, since sanitation contractors do not deign to scale 30-foot heights, the workers must descend from the line “because companies will only clean portable bathrooms downstairs on the street level,” said Garrett Scalza, 30, who was supervising a group of carpenters near Gansevoort Street. And since the High Line extends through residential areas, “We can’t make noise early or late, or work on the weekends,” Mr. Zimmermann said. Despite extreme heat and fierce cold, so far workers have experienced only minor injuries, save for one carpenter who tripped and fell three feet and lost five days of work. Near Gansevoort Street, laborers are already installing the concrete planking surface destined to be a walkway for visitors. Cast in Quebec and weighing 600 to 800 pounds, the planks — some 7,600 of them — are hefted by forklifts “and then we muscle them into place with crowbars,” said Emilio Arostegui, 40, who heads a labor crew. They are jigsaw-puzzle pieces of a structural system of pedestrian promenades that extend like concrete fingers into the planting beds that will restore the park greenery using 6,300 cubic yards of soil. Workers up on the line are laboring to complete the first, $71 million, phase of the $170 million High Line construction, a section from Gansevoort Street up to 20th Street. “Next fall’s opening is breathing down our neck,” said Peter Mullan, director of planning for Friends of the High Line, a nonprofit group that helped block attempts to demolish the viaduct and helped design its renovation. 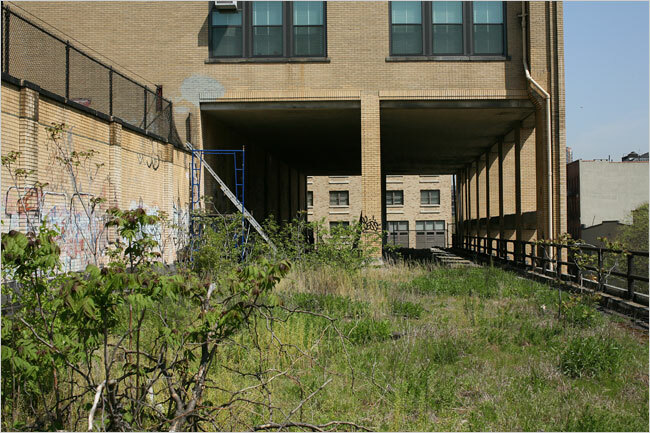 The structure is owned by the city south of 30th Street under the jurisdiction of the Department of Parks and Recreation and the Friends of the High Line. The city’s Economic Development Corporation is overseeing construction on the site along with the mayor’s office and the Department of City Planning. The remainder of the city-owned roadbed is scheduled to become a park by 2009. Another half-mile section rings the railyards north of 30th street and 12th Avenue, and five bidders are competing to develop the property; only three want to preserve that part of the High Line. Enemies of the High Line once claimed that the corridor, built from 1928 to 1934, was disintegrating in a rain of concrete. But despite its appearance, engineers have found it to be mostly well preserved and massively strong, “built to support locomotives, designed for 10 times the load it will carry as a park,” said Michael Bradley, the High Line’s project planning administrator for the parks department. Already, workers have ripped out the High Line’s original roadbed down to the concrete slab, removing gravel, tracks, ties, soil and the urban wilderness of vegetation that had seeded itself there. This was mandatory, Mr. Mullan said, since toxic chemical contaminants had leaked from the freight trains, the last of which bowled through with a load of frozen turkeys in 1980. “We are changing out steel beams, preparing the structure to carry a park instead of freight trains,” said Tom Ryan, 41, an ironworker who leads a restoration crew. “There are a million rivets on the High Line, and I’ve only replaced 10,000,” he said, deadpan. The original freight rails — which had been temporarily relocated to the northerly reaches of the trestle — are now being reinstalled to the south as design elements only. Workers have just put in the first rail junction, called a frog “because that’s what a frog looks like after it’s been run over by a locomotive,” Mr. Ryan said. By their industrious presence, the workers have relocated the pigeons that once found their earthly paradise at the underside of the trestle, producing decades of D’oh! dry cleaning moments for unlucky pedestrians. “Pigeons know to stay away from people in hard hats,” said Mike Forbes, 35, an on-site construction draftsman. Since acidic pigeon waste corrodes the steelwork, laborers have been installing permanent, harmless anti-pigeon shields — angled plates welded atop girders — as well as strategically stretched flexible steel wires to deter birds’ happy landings. “The thing is, the pigeons keep coming back,” said Mr. Marriott, adding that birds have already made modifications to the High Line not envisioned by the designers, Field Operations and Diller Scofidio & Renfro of Manhattan. “They’ve created new nests in the temporary pigeon netting that was installed” as a prelude to the permanent pigeon shields, he said. On the line, there is a perpetual incongruity between the grit above and the glitz below. As winds scoured the High Line tunnel through the Chelsea Market on a recent afternoon, Fernando Espino, 36, was shoveling construction debris on the concrete slab above the roof of the Morimoto restaurant, while unseen diners below tasted truffled tofu and summoned the Iron Chef’s sake sommelier. Workers have long been inured to the spectacle of meat hanging on hooks in the same meatpacking neighborhood where supermodels slink to fashion shoots, where Beyoncé shops and Cameron Diaz heads to her scheduled hair appointment. Thanks for those great links. There's a picture in the slideshow of a welder working on the railing and it's looking excellent. The opening of the first segment is such a great thing to look forward to in 2008. Imagine the crowds that'll be checking it out the first weekend. This is one of those projects that reaffirm my love for this town despite all of the unfortunate things we witness. Are there any photos of the High Line taken in this month? Renderings of the High Line project at 23rd Street in Manhattan. 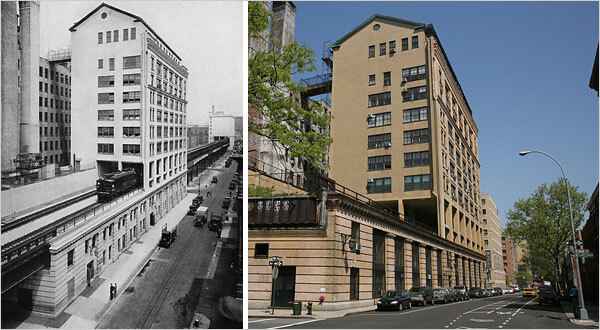 The unit will be the second building which wraps around the decaying highline industrial relic. The transformation of the High Line from a rotting railway to a postmodern park traveled further down the track Wednesday as plans were unveiled for a new tower slated to open next year. The building, called HL23, is the first project by architectural theorist Neil Denari. It will lean above the elevated park at an angle and taper upward to give the appearance of growing out of the old rail bed. "The site makes what the building is, happen," Denari said. " The High Line is the start of the action. I used to live near there, and I always thought that if you could give me my choice of places to build in the city, I'd take this one." Denari's not the only one. There are now more than 40 projects going up around the elevated railway, and the area is quickly becoming known in architectural circles as a global hotspot for new and interesting buildings. "Because there is no context in this neighborhood, I thought you could do something different," said Alf Naman, the project's developer. The 11 residences at HL23, which gets its name from its location on West 23rd Street between 10th and 11th avenues, will range in size from 1,850 to 3,600 square feet, and cost between $2.65 million and $10.5 million. The project was unveiled Wednesday at Craftsteak, a Chelsea restaurant, to brokers and industry insiders. The 14-story building will be the focus of a June exhibit at the Museum of the City of New York on new architecture and the High Line. Some locals are wondering, though, if development in the area has gone too far. "It's too much, and it's a lot of dust and traffic," said Silvia Baldwin, 58, a 16-year resident of the neighborhood, as she pointed to the forest of construction cranes looming over her West Chelsea street. "I feel like we're losing too many low-income people." John Tyler, 65, a life-long resident of the area, agreed. He used to work on the piers unloading ships and remembered when the neighborhood was mostly tenements and trains ran on the strange tracks that seemed to float in the air. "I wish it didn't change so fast," he said. "What was here they should have left alone. They should just let certain parts of Manhattan be." Work is well underway on Section 1 — the southern part — of the High Line park project. Section 1 is expected to open by the end of this year. The public space on the High Line is now taking shape above the streets and sidewalks of the Meatpacking District and West Chelsea. Landscape construction has started on Section 1 of the High Line (Gansevoort St. to 20th St.). Workers are installing the park’s pathways, made of long, smooth, concrete planks. These planks are tapered at the ends to allow plants to push up through the gaps, blurring the boundary between the hard surfaces and the planting. Some of these planks curl up from the surface of the pathway to create the High Line’s signature benches. At the same time, the construction crew is reinstalling many of the steel rail tracks, where trains once ran. The tracks were marked for their original location before being put in storage during site preparation. They are now being returned to these locations, incorporated into the plantings, as a reminder of the history and original purpose of the High Line. There will be an access point rising from street level about every two blocks in Section 1. At two of these points — one at Gansevoort St. and one at 14th St. — the stairway will cut directly through the steel structure itself. This will bring visitors up through the massive steel beams and hand-driven rivets of the High Line, coming face to face with the structure itself, before arriving on the landscape on top. Workers recently removed sections of the steel I-beams at both of these locations, creating cutaways for the stairs. Later this spring, a team of horticulturists, led by Dutch planting designer Piet Oudolf, plan to start planting on the High Line. The plantings in the park are inspired by the wild landscape that grew up naturally on the structure after the trains stopped running. There will be a focus on native and drought-resistant plants, with many of the same species of grasses and shrubs that were originally found on the High Line. Section 1 is projected to open by the end of 2008, and Section 2 (20th to 30th Sts.) is projected to open by the end of 2009. Although the High Line up to 30th St. is secure, owned by the city, and on its way to becoming a public park, the future of the High Line north of 30th St. is still uncertain. This section, about one-third of the line, wraps around the West Side Rail Yards, a 26-acre site owned by the state-run Metropolitan Transportation Authority. The M.T.A. is planning to lease the rail yards site to a private developer for high-density residential and commercial development. As part of this development, the High Line at the rail yards might be partially or fully demolished. Friends of the High Line is working with city, state and federal elected officials and community leaders to ensure that the High Line is fully preserved at the rail yards. F.H.L. has also started a Rail Yards Blog to monitor activity at this important West Side site: http://railyardsblog.org. Friends of the High Line is now transitioning into a conservancy organization, which will work with the New York City Department of Parks and Recreation to maintain and operate the park when it is complete. As part of this transition, Friends of the High Line has recently launched a Charter Membership program. Membership dollars will help make sure the High Line is maintained and operated at a high standard, making it a well-loved neighborhood park. Friends of the High Line is planning a full roster of community events in the year leading up to the opening of Section 1. To learn more about becoming a Charter Member, upcoming events and volunteer opportunities, please visit www.thehighline.org. You can also read the High Line Blog at http://blog.thehighline.org. dates from 1911, before the High Line was a glimmer in its daddy’s eye. After the jump, the 1934 London Terrace Tatler waxes eloquent about the Cowboys and their brave ponies. Note: This story was taken from the London Terrace Towers site, which has a great history section. 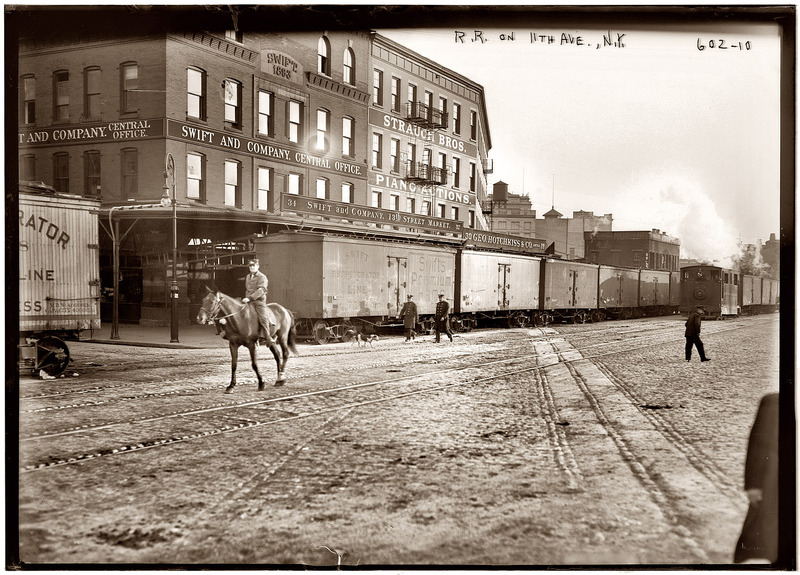 Every resident of London Terrace knows , and we believe, likes the cowboy riders of the New York Central, who day and night, rain or shine, majestically precede the electric trains along Tenth Avenue. For over eighty years this unique custom has been in existence, but now, even as the riders of the West have faded into glamorous limbo of romance, their own day is drawing to its close. With the early completion of the overhead roadway, they will disappear from the streets of New York, leaving many to change “The Last Round Up” as the brass bands announce the official opening of a modern Manhattan miracle. The story of these riders goes back to December 4, 1850 when the City Council passed a law compelling trains on the streets of New York to be preceded by a rider on horseback, on block ahead of the locomotive, waving a red flag by day and a red light by night to warn pedestrians and prevent runaways of horse-drawn vehicles. This quaint law is still in force, and the New York Central must, until it rises above the street, provide its riders or suffer revocation of its franchise. The Tenth Avenue freight route extends from 30th Street south to St. John’s yards below Canal Street, a distance of about two miles. To cover the operation of the various trains, a staff of twelve riders is maintained. These boys, who must all be over eighteen years old, are almost wholly recruited from Tenth Avenue and West Street, and strange as it may appear, riders are difficult to find, and only those who have, by strange fortune, learned to ride in the county are used, because a country boy knows and understands horses, and is thus prepared for any unexpected excitement that might affect his steed. 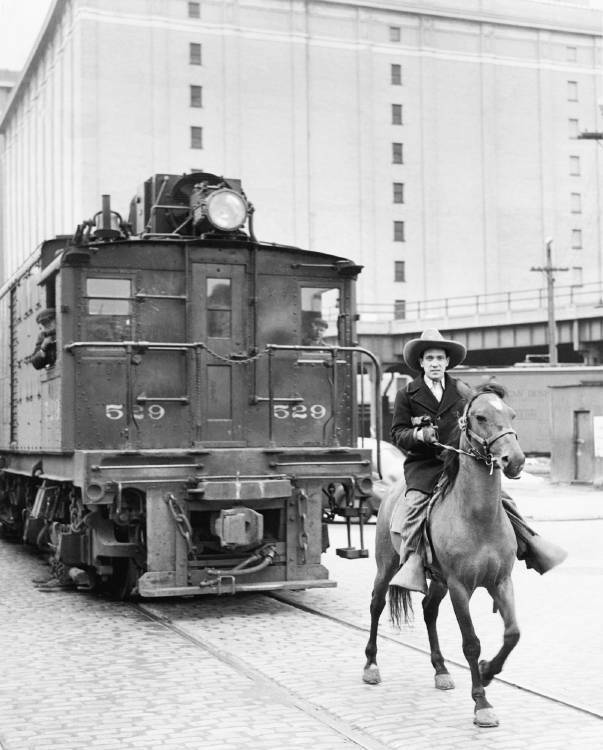 The “Ranch Boss” of these cowboys is the Superintendent of the New York Central Freight Yards, and since the law has been in effect two of the riders have risen from the range to the important position of Yard Masters. The horses used in this unusual service are tried and true, and are perfectly aware of their important mission in life. They know traffic and excitement, thick fogs and blinding storms, the deep-throated adieus of departing liners and the tremendous thrill of screaming fire engines, but through it all they move surely and serenely, carrying out the Law of the City Council and giving opportunity for their gallant riders to amuse the passerby with amazing variation of the routine waving of the red lanterns. The effective term of duty of these mounts for this service is over eight years, duet to the special care and the use of rubber padding on their hoofs, and when their usefulness on the city pavements is over they are auctioned off at the Bulls Head Horse Market to continue their lives on softer turf in greener pastures. The portion of the High Line from 30th to 34th Streets is still owned by the CSX Railroad Company despite being unused. Is this a problem? I don't know what we can do about this. How much use is this park likely to see? I think this is going to be less used that alot of the "bonus plazas" that were created by the tower in plaza zoning. ABOVE THE TRACKS The Western Electric complex, seen from Washington Street, in 1936. At right, the artists' housing complex Westbeth. THE first section of the new High Line park is moving toward completion, six blocks of hulking elevated rail line along the lower West Side, converted to an urban symphony of walking paths and landscaping — with one exception. Under the artists’ housing complex Westbeth, on Washington between Bank and Bethune Streets, one little section of the old rail line continues in a glorious romantic desuetude. A section of the old elevated freight line where track ties are still visible. In the 1890s, Western Electric began building a factory complex on the block bounded by Washington, Bank, Bethune and West Streets. A subsidiary of American Telephone and Telegraph, Western Electric built the phones leased by AT&T to its customers, which added substantially to company revenues. In 1900, Western Electric completed the principal structure on the site, 463 West Street, designed by the architect Cyrus L. W. Eidlitz. Thirteen stories high, the structure had an ornamental entrance flanked by giant lanterns but was otherwise homely and utilitarian. In a few cases the double track had nowhere to go but through existing structures, and in 1931 Bell Laboratories had to partition off space in its building between the second and fifth floors to make way. The elevated rail line was a success until after World War II and the growth of the trucking industry. In 1970, the High Line was cut at Bank Street, and 10 years later the route closed entirely. The owner at the time, Conrail, was happy to surrender the line to Peter Obletz, a visionary whose hopes for resurrecting local passenger rail service ultimately fizzled. It was easy in the ’70s to sneak up to the track bed and explore a kind of industrial lost world: rail detritus disappearing under moss and plants — an urban Zen wilderness above the din of traffic. As for Bell Laboratories, it continued in its building until 1966, then moved most research operations to New Jersey. It was in the mid-1960s that a group of arts activists, financed by the J. M. Kaplan Fund, took over the block and created Westbeth, a complex of subsidized housing for artists. By 1992, the High Line was cut at Bethune Street, marooning the 235 feet of track that run under Westbeth. Four blocks north, the High Line portion from Gansevoort Street up to the 30th Street Yards, meanwhile, became a project for activists, who lobbied to make a park of it; the Bloomberg administration endorsed the plan in 2002. Joshua Laird, an assistant commissioner at the Department of Parks and Recreation, said recently that construction work on the portion from Gansevoort to 18th Street would be complete in September, although an opening date has not been set. Drawings for the project, designed by Field Operations and Diller Scofidio & Renfro, are posted online at dillerscofidio.com, and show a subtle, varying series of plantings and pathways. But the site necessarily has a “managed” feel; its quality of evocative romantic decay will disappear. Not so on the Westbeth portion — where, about 25 feet above the sidewalk, the romance survives. The northerly half of the line, covered over by the building, is almost entirely free of plants. But the southerly part is open to the sky, and feels like an Irish heath, the ballast underneath the thin cover of plants yielding slightly underfoot. The rails are gone, but rusty spikes, metal objects, a wooden tie and other leftovers attest to a time when rail was king. Steven Neil, executive director of Westbeth, says that because apartments line the wall along the rail line, the only access to it is by ladder. “People come up with ideas” for taking advantage of the space, he said, “especially when we have a budget deficit.” But Westbeth, which is a not-for-profit corporation, has never been able to come up with the money. City officials and the Friends of the High Line presented the final design on Wednesday for the first phase of the High Line, the $170 million park that is under construction on the West Side of Manhattan and has been called one of New York City’s more distinctive public projects. The park, modeled loosely on the Promenade Plantée in Paris, is being built on a 1.45-mile elevated freight rail structure that stretches 22 blocks, from Gansevoort Street to 34th Street, near the Hudson River. The rail structure, built to support two fully loaded freight trains, was built from 1929 to 1934 when the West Side was a freight-transportation hub, but has been unused for decades. The tracks are 30 to 60 feet wide and 18 to 30 feet above the ground. Ground was broken in April 2006. Over the past two years, crews have been constructing the first, $85 million segment of the 6.7-acre park, which is estimated to cost $170 million and is financed by federal, city and private money. At a news conference in Chelsea, officials unveiled two sets of final designs: for the first phase, which will stretch from Gansevoort Street to 20th Street and be completed by the end of this year, and for the second phase, which will go from 20th Street to 30th Street and be completed by the end of 2009. “The High Line will be like other parks in our city’s system, but it will also be distinct — a park in the sky, unlike any other,” Adrian Benepe, the city’s parks commissioner, said in a statement. The designs for the park are the creation of a team led by Field Operations, a landscape architectural company, which, along with architects from Diller Scofidio + Renfro, won a 2004 design competition. The Museum of Modern Art exhibited the team’s preliminary designs for the first phase of the High Line in 2005. The new designs reveal with greater precision the important elements of the park’s first phase, including Gansevoort Plaza, the park’s southern terminus in the meatpacking district and a major access point for the park; the “slow stairs” that will gradually ascend from street level to the elevated rail bed; and a two-level sundeck between 14th and 15th Streets that will offer views of the Hudson. It will also have an art installation space where the park cuts through the Chelsea Market, formerly a Nabisco factory; and the 10th Avenue Square, an area of steps and ramps at 17th Street where visitors can descend into the lower part of the elevated railway. An additional $14 million has been designated for a plaza and stairs to the park, still to be designed. A third and final phase of the High Line, still in the planning stages, involves a half-mile section ringing the railyards north of 30th Street and 12th Avenue. A developer, the Related Companies, won a contract in May to redevelop the railyards with the park as part of its proposal, but who will finance that final phase of the project remains unclear. Robert Hammond, co-founder of Friends of the High Line, a nonprofit group established in 1999, which will eventually manage and operate the High Line in cooperation with the parks department, said the park’s grand opening had not been scheduled but was likely to take place in December or January. Asked whether the cold months were the best time to open a new park, Mr. Hammond replied that the timing would allow officials — and the public — to acclimate themselves to the new space. “One of my biggest concerns is over-success,” he said. “It’s not MoMA. It’s not the Sheep Meadow. It’s a relatively small park. One of the advantages of opening the window is, it’s almost like a soft opening. As it gets more beautiful in the spring, we’ll be figuring out how to manage it. A straight walkway, running alongside the railroad tracks, is surrounded by a landscape of native species that once grew spontaneously on the High Line, interspersed with new species that ensure bloom throughout the growing season. Steel is cut away and replaced by glass, providing a view up 10th Avenue, and revealing High Line visitors to pedestrians on street level. The Sundeck, between 14th and 15th Streets, offers unobstructed views over the Hudson River. Water emerges from the spaces between planks to skim the upper walkway, while on the lower level, rail tracks are reinstalled in plantings derived from the High Line's native landscape. The structure steps down to the Hudson River, with oversized wooden deck seating along the railroad tracks on the upper level, and a rail preserve with dense native planting on the lower. Access points are located approximately every two to three blocks on Sections 1 and 2 of the High Line. In many locations, these access points include both stairs and elevators. Steps and ramps cut into an elevated square over 10th Avenue, allowing visitors to descend into the structure. The textured concrete walking surface meanders through tall plantings in the Chelsea Thicket. Where the High Line begins to narrow in Chelsea, plantings grow denser, with shrubs and trees adding a variety of textures. The High Line's only lawn "peels up" at 23rd Street, where the High Line widens, providing crosstown views of the Manhattan skyline and the Hudson River. A stepped seating feature adds another layer of use to this central gathering area. A metal walkway lifts off from High Line level, allowing the landscape to fill in below. Visitors are lifted into the shady canopy of a sumac forest. Planting here takes advantage of a cooler, shadier condition between tall buildings, where trees originally grew up once the trains stopped running. Some of these walkways don't look very wide. It'll be a Hudson River Park esplanade type facility. No biking, no rollerblading, and (should be) no running. The High Line itself isn't all that wide in many places. Definitey won't be a place to visit on the weekends (if Hudson River Park is any indication). And just imagine when the stroller moms go up to do some strollin'.